If you want to create a law business website, you can use the Private Lawyer theme. Even though the theme is Private Lawyer, you can use it for creating any kind of business website in minutes. WordPress theme to create your law business website? Here are some of the best Multipurpose law themes for private lawyers or a law firm. Using these law business WordPress themes , you can create beautiful websites for lawyers, Legal Firms, Law Firm, Legal offices, law practices, civil law, Legal Advisers, legal help, Attorney websites or any kind of legal institutions. These WordPress themes are programmed to let you build helpful law business websites. These are the informative websites about your law firm, to tell your visitors everything about your profession. So whether you are a professional lawyer, or a law firm owner, it is must for you to create your unique websites as a form of your online presence. With your law business website online, your prospective customers can know more about you and easily reach you. Your law firm website can tell people about your work, experience and let them contact your easily. Such a website is sure to boost your credibility and help you win more clients. Therefore, there’s no reason not to create your lawyer website. Especially when you can do it all by yourself, without hiring programmers. These law office WordPress themes are easy to use and come with subject-specific design and features. They are specially designed for creating lawyer’s websites. So these WordPress lawyer themes come with features that work best for law office websites. No extra features to complicate your website and make it complex. Even though there are no auxiliary features to make this law firm website template more feature rich, the theme features are enough. There are no extra modules to confuse you. All the features integrated with this Lawyer WordPress theme are enough for a tell it all lawyer website. Therefore, these law website templates let you create simple as well as sophisticated lawyer websites easily. All the features and options at the backend are easy to understand. Because the lawyer themes are designed for simplicity. It does not hand you a jumble of options to edit and customize. Here is the law firm and lawyer WordPress theme to create amazing websites for lawyers. All these themes here are specifically designed keeping the requirements of law business in mind. With these WordPress lawyer themes, you can create websites for law firms, private attorneys, solicitor, counsel, barrister, and other legal arbitration. These themes come with all the page sections to let you show your services and share your work experience. Besides that, these lawyer base WordPress themes come with a working contact form to let your visitors reach you easily. When you hire technical experts to create your law business website, they may need a lot of help. You may have to explain your business model, website requirements, and service details to get your website created. So hiring experts for your law websites may prove to be expensive and time-consuming. Instead of spending time and resources here, you can use these lawyer base WordPress themes to create your law-related website. These WordPress themes for lawyers designed and developed after much research and strategic planning. All the features are specifically designed for a law website. 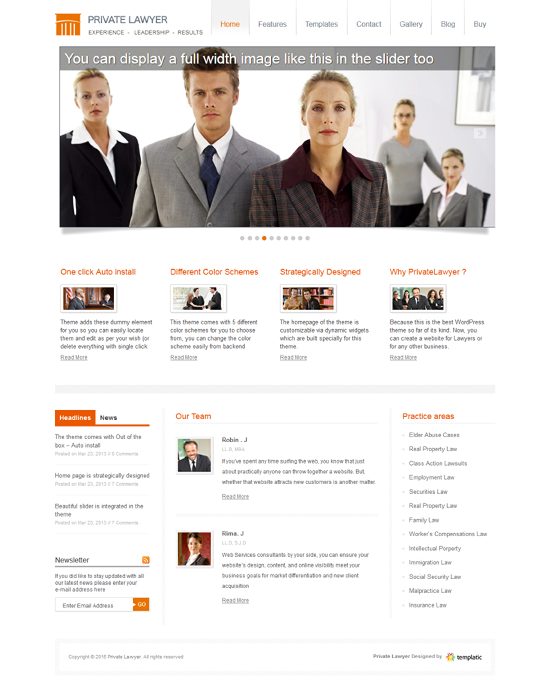 The lawyer WordPress theme here is sketched specifically for law firms. So these WordPress lawyer templates let you create professional looking law websites effortlessly. As the Lawyer & Attorney WordPress Themes are crafted keeping your law practice in mind, it comes with all the facilities to showcase your services, describe your expertise and tell about your law firm. These Law firm website template comes with an intuitive and logically designed homepage. First of all, you can use the slider to display image banners and videos on your lawyer WP website. You can also use the different page templates and the gallery section to showcase your firm’s achievements. The WordPress lawyer theme comes with a pre-designed widget to let you introduce your team too. There are many other features of the WordPress lawyer theme to let you share your experience and expertise. This WordPress theme for lawyers, consultants, financial and law firms are designed to let you create amazing business websites, quick and easy. These Lawyers Themes come with some pre-designed page templates for a quick start. Use different page templates to create different types of websites. There are different page templates like pages with and without sidebar, ready to perform contact form, a gallery page template, etc. You can reuse these page templates to create different pages on your website. All the page templates included in the lawyer WordPress themes are highly customizable and easy to use. All the page designs are widget ready. So the page structure and the location of content blocks can be changed as per your requirements. You can make all the major changes to your website by moving the widgets in and out of the widget areas. With the dynamic sidebars on your page designs, you can make the best use of the sidebar space to display the information that matters. When using the pre-designed WordPress Lawyer website templates, you require enough customization options to create your website with all the personalization you need. These law firm website templates come with easy options to make your website look exactly the way you want. You can upload the logo, change the colors, change the images, and make unlimited changes. These WordPress law themes are flexible and can also be used as simple business website templates. The WordPress Lawyer themes also come with a custom CSS so that you can easily change the CSS behaviour without looking for actuall .css files. All the WordPress lawyer themes mentioned here are easy to use. They come with easy options to create and maintain your website on your own. It is rather difficult to find professionals to create your law business website. And the more difficult part is getting in touch with them again and again whenever you want minor changes to your law business website. So the best option is to create your website on your own. Because websites for your law firms or law business are like simple business websites. They generally are a collection of static web pages. Such websites are easy to manage, and their operation is less time-consuming. So these WordPress themes are developed for individual attorneys as well as companies to create their website on their own. With very few efforts, you can create professional looking WordPress construction business websites in minutes. WordPress lawyer themes are designed to make it easy for your prospective clients to reach you. The lawyer and attorney themes in this list come with a ready to use contact form. Using this contact form, your visitors can directly send you a message. They can use this contact form to ask for an appointment or send their inquiry. On your contact form, you can also mention other details like email id, telephone number, office address etc. A contact form is, therefore, one of the most important modules of your law firm WordPress theme. With this WordPress lawyer theme, you get a custom designed contact form. This form can act as a medium of communication between you and your website users. Once your website gains enough traffic, you can start displaying advertisement banners on it. This WordPress lawyer theme comes with the features to let you make money by displaying advertisement banners. You can display static advertisement banners on your WordPress lawyer themes. These advertisements can be static banners from your sponsors. Or you can opt for services like Google AdSense to display advertising banners on your law business website. The simple idea behind creating a construction business website is to ensure that your business is represented on the internet. It can be found by the people looking for the services you provide. Also, your clients can have a better idea of your business and work experience. When creating a law business website, your main intention could be something different than making money out of it. Therefore, you might not be looking for a law business website with monetization features. However, ad monetization is the simplest form of making money through your law website. You can even use the ad banner spaces for other purposes. You can advertise your own special offers, or images of your accomplished projects, etc. Who can use these lawyer WordPress themes? These Law office WordPress themes can be used by private attorneys, law firms, and legal practices. They are specially developed for lawyers, law firms, attorneys as well as companies. Even though these themes are developed for individual attorneys as well as companies and ideal for Law offices, they can be used to create an online portfolio for the lawyer, attorney firms, and agencies. With these legal consultancy website templates, creating a website for your legal practice or law firm has become easier than ever. These themes are designed to meet the professionalism of your legal firm, advertise your law services and let your visitors easily get in touch with you. Besides creating a website for your legal practice or law firm, you can also use this WordPress lawyer theme to create corporate business websites effortlessly. These lawyer WordPress themes are truly multipurpose. These Lawyer themes are flexible enough to let you create a simple business or a portfolio website of any kind. Even though it has main features for law firms, it can do much more. You can create websites for lawyers, attorney, solicitor, barrister, law firm, or any other type of legal and law-related business. You can also adapt and use this law business wordpress theme for any other type of business. How long can I use these WordPress lawyer themes? You can use this WordPress lawyer themes forever. Once purchased, these law practice WordPress themes are yours to use for as long as you want. The theme updates and support are limited to one year of purchase. But you can still keep using the themes without updates, if you don’t wish to renew your license. Does this lawyer WordPress theme support appointment booking? No, the lawyer WordPress theme mentioned here are simple law website templates. They do not support booking or reservation features. Can I upload videos on my lawyer website? Yes, this Lawyer WordPress theme is multimedia ready. You can upload graphics, images and videos to your law business website easily. These media can be on your theme pages or WordPress blogs. Is this an eCommerce ready law business website template? For now, this WordPress theme for lawyers and attorneys, does not support eCommerce or integration of the WordPress eCommerce plugins like WooCommerce. The law business website templates are designed only for simple lawyer websites. Can I use this law WordPress theme to display events? No. These are simple lawyer WordPress themes marked specifically for law firms. You cannot integrate event calendar plugin into your law business WordPress theme. However, you can advertise your events on your law firm website by displaying banners or creating a page for the event details. How do I create a law business directory using the lawyer WordPress themes? You can create a location based business directory for all the law firms in your city or state. However, to do so, you should check out these location based WordPress directory themes. I want to upload my previous case studies on the law business website. Can I do so? Yes. The law business WordPress templates has the features to let you create law business websites. You can create special pages to describe your work or use the blog sections to write about your work experience.